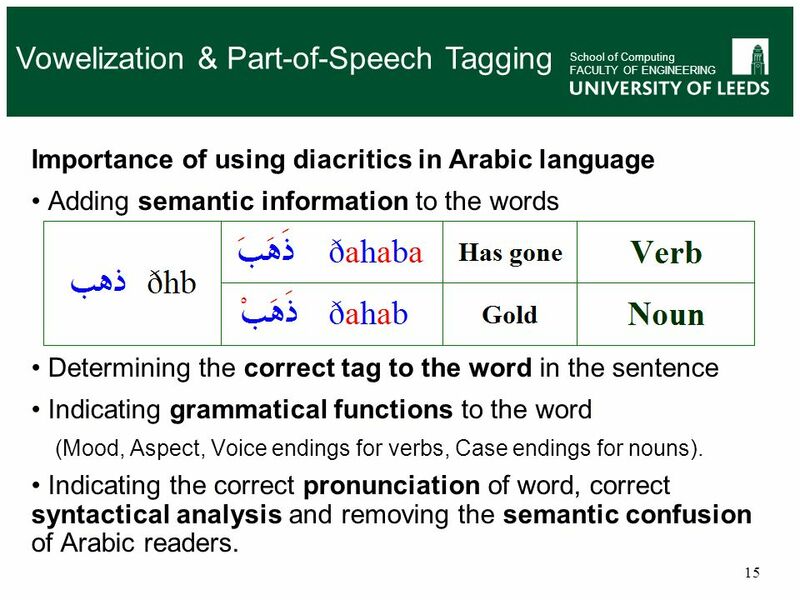 3 Introduction What is Part of Speech Tagging? What is a tag? 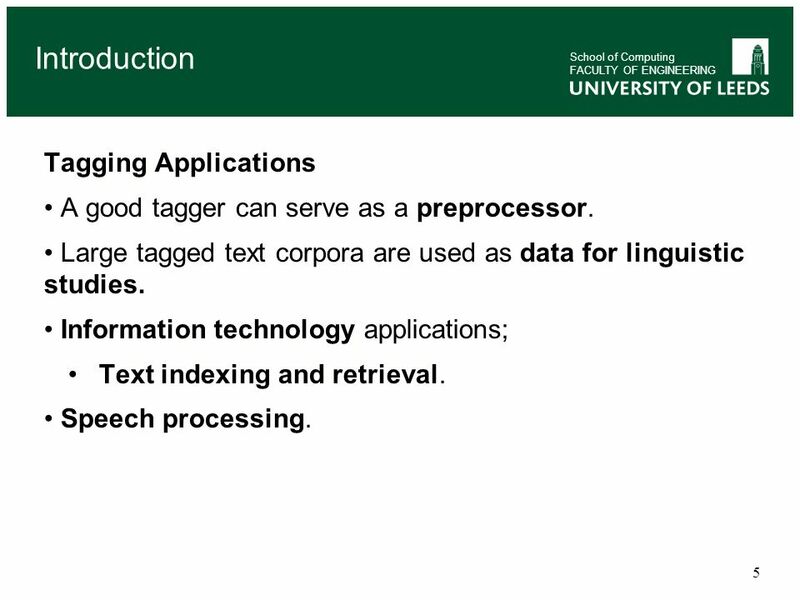 School of Computing FACULTY OF ENGINEERING What is Part of Speech Tagging? What is a tag? What is the tagsets? 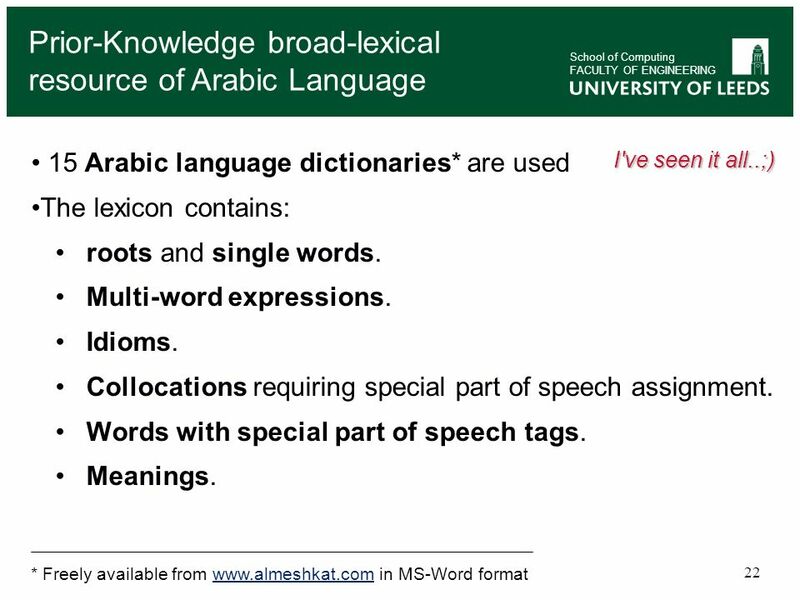 Our Aim How to widen the scope of Arabic Part-of-Speech tagging, to develop a system which can process Arabic text in wide range of formats, domains, and genres of both vowelized and non-vowelized text ? 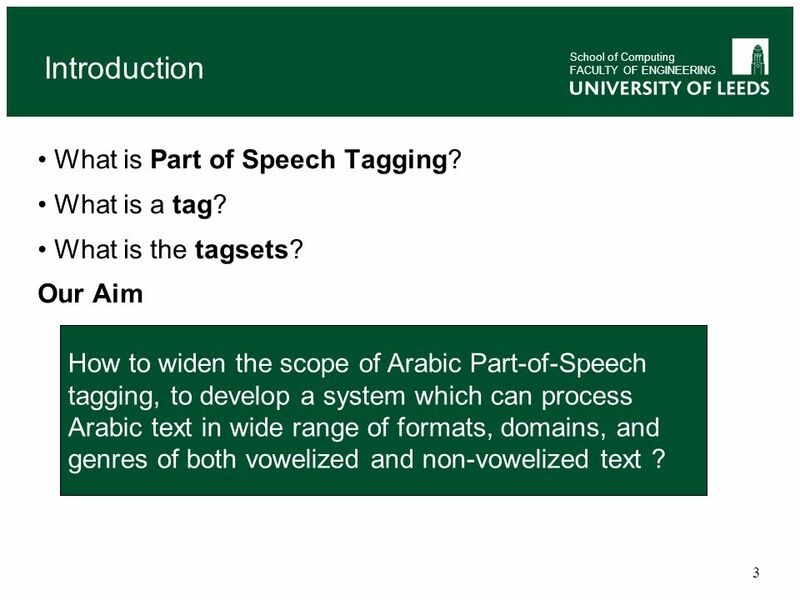 School of Computing FACULTY OF ENGINEERING How to widen the scope of Arabic Part-of-Speech tagging, to develop a system which can process Arabic text in wide range of formats, domains, and genres of both vowelized and non-vowelized text ? 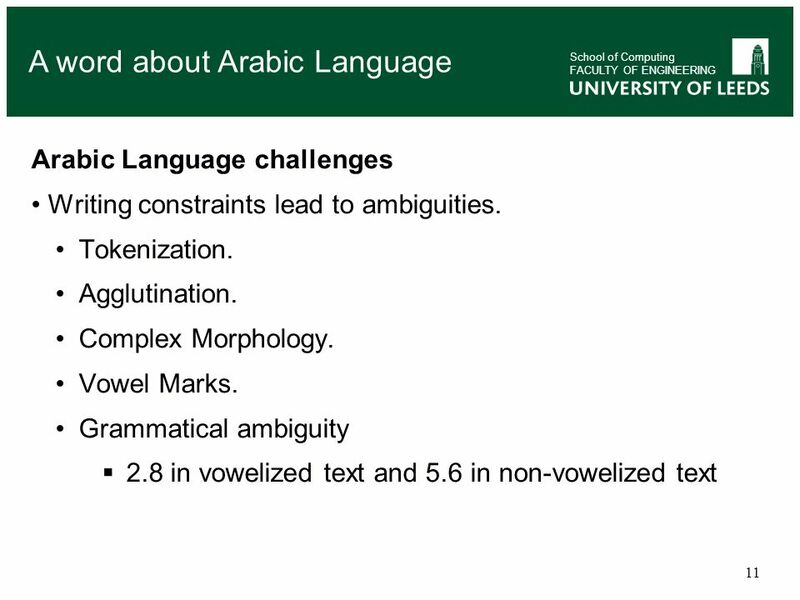 Research sub-questions: Can richer lexical resources derived from dictionaries and grammar text books improve the coverage of morphological analysis for wider range of Arabic text formats, domains and genres? 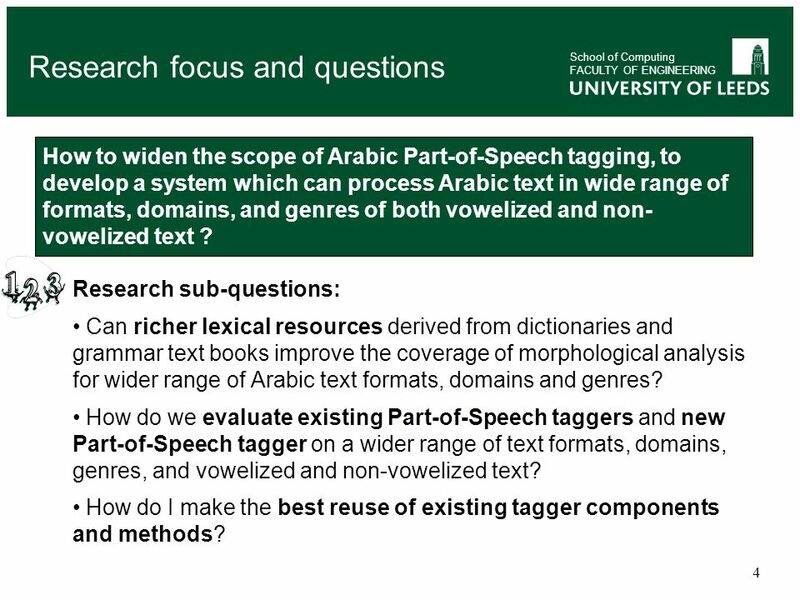 How do we evaluate existing Part-of-Speech taggers and new Part-of-Speech tagger on a wider range of text formats, domains, genres, and vowelized and non-vowelized text? How do I make the best reuse of existing tagger components and methods? School of Computing FACULTY OF ENGINEERING Tagging Applications A good tagger can serve as a preprocessor. 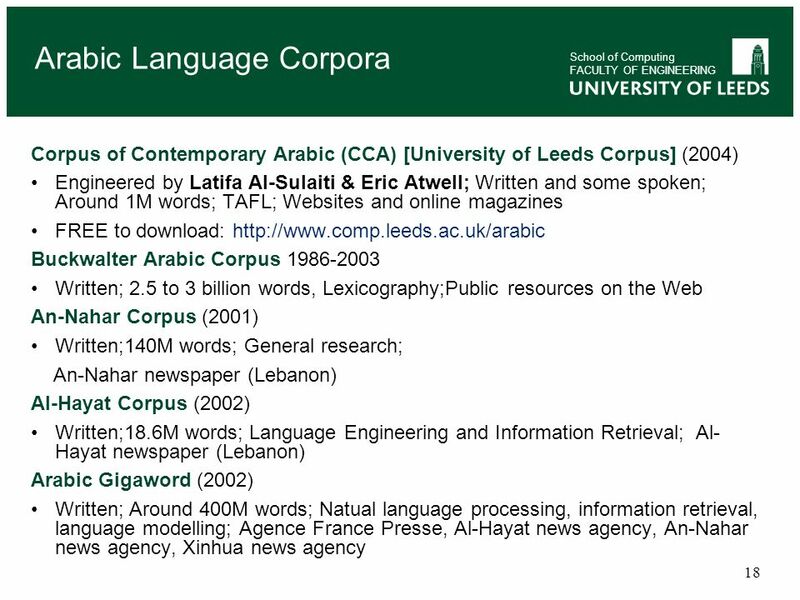 Large tagged text corpora are used as data for linguistic studies. Information technology applications; Text indexing and retrieval. Speech processing. 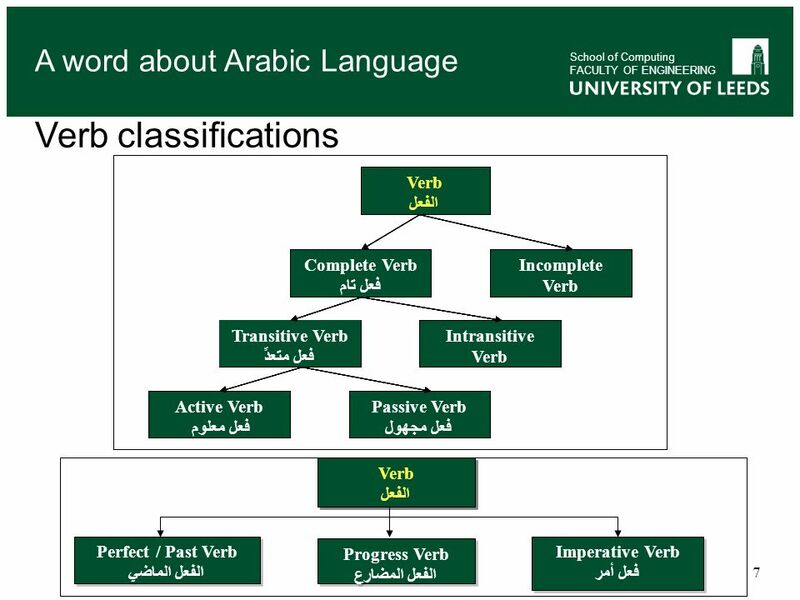 School of Computing FACULTY OF ENGINEERING Arabic language linguists classify words in Arabic into three main categories. Verbs: that word which denotes an action and has tense. Nouns: name of a person, place, or object and does not have any tense. 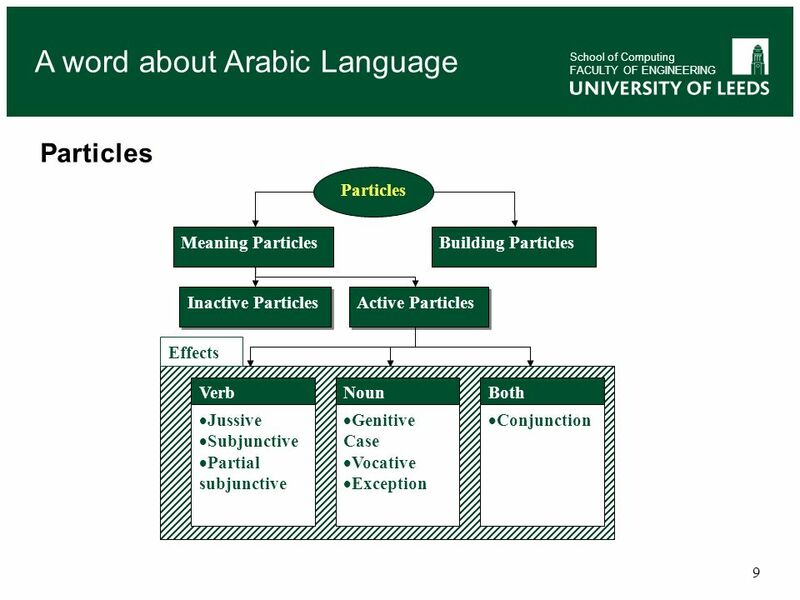 Particles: that word of which cannot be understood without joining a noun or a verb or both. 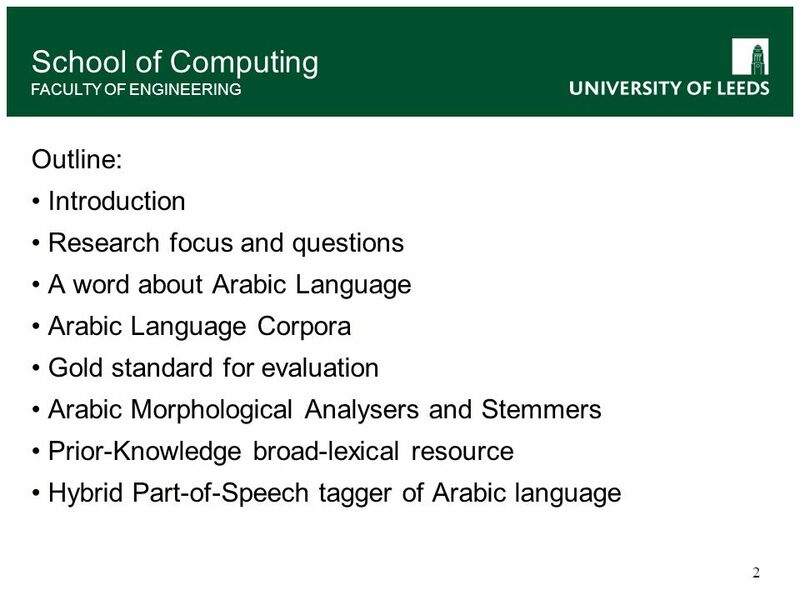 School of Computing FACULTY OF ENGINEERING Evaluating existing Arabic tagsets. 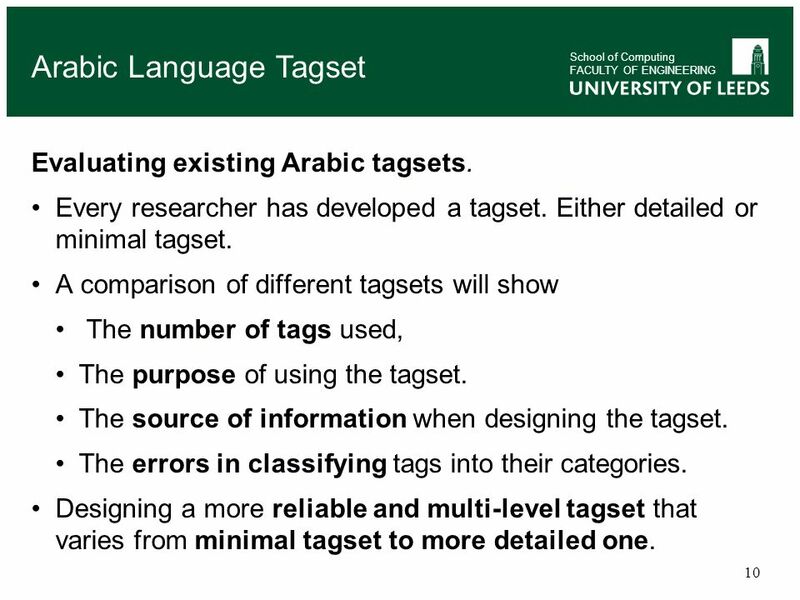 Every researcher has developed a tagset. Either detailed or minimal tagset. 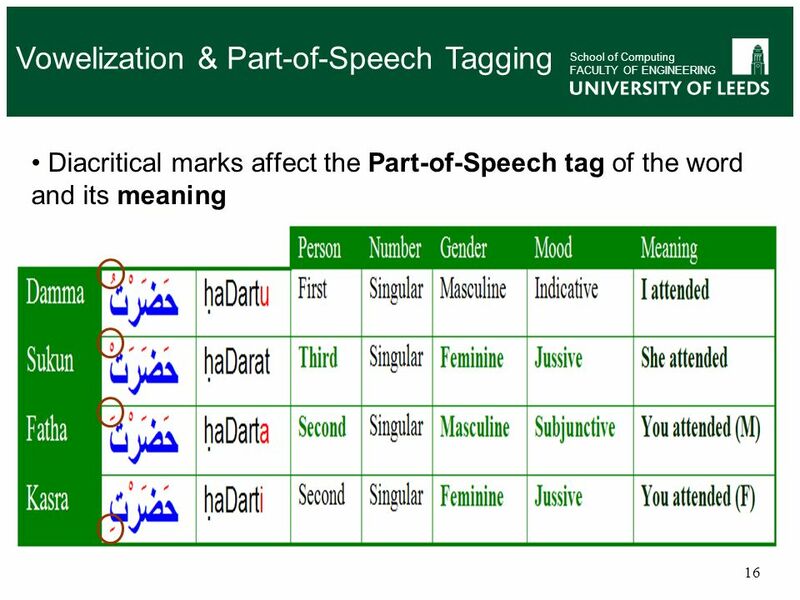 A comparison of different tagsets will show The number of tags used, The purpose of using the tagset. The source of information when designing the tagset. The errors in classifying tags into their categories. Designing a more reliable and multi-level tagset that varies from minimal tagset to more detailed one. 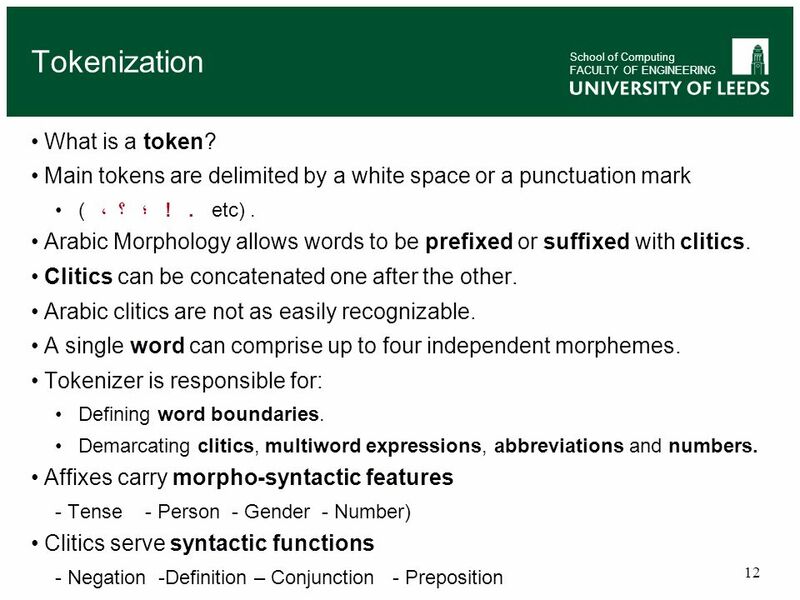 12 Tokenization What is a token? 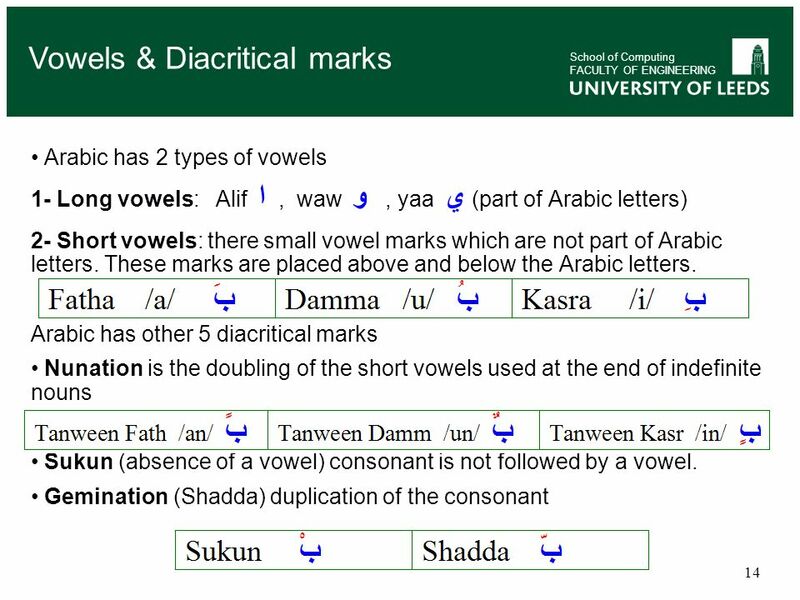 School of Computing FACULTY OF ENGINEERING Importance of using diacritics in Arabic language Adding semantic information to the words Determining the correct tag to the word in the sentence Indicating grammatical functions to the word (Mood, Aspect, Voice endings for verbs, Case endings for nouns). 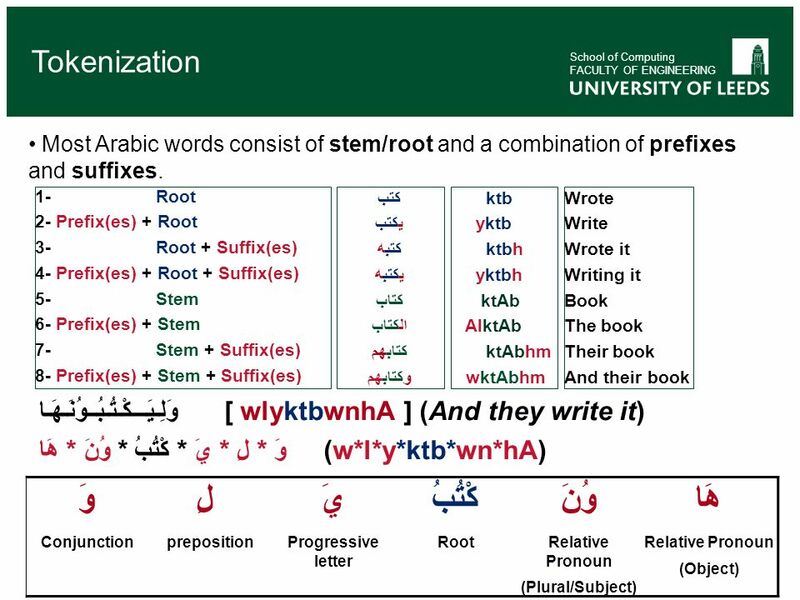 Indicating the correct pronunciation of word, correct syntactical analysis and removing the semantic confusion of Arabic readers. 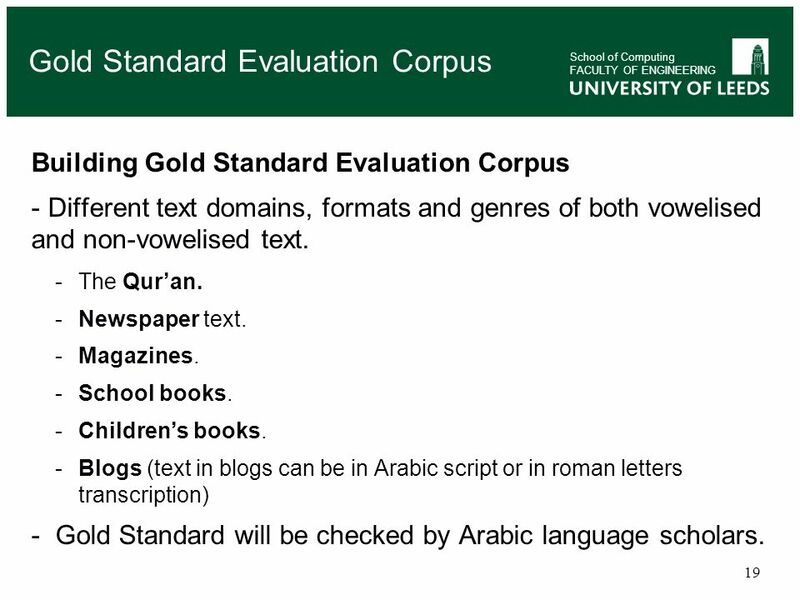 School of Computing FACULTY OF ENGINEERING Building Gold Standard Evaluation Corpus Different text domains, formats and genres of both vowelised and non-vowelised text. The Qur’an. Newspaper text. Magazines. School books. Children’s books. 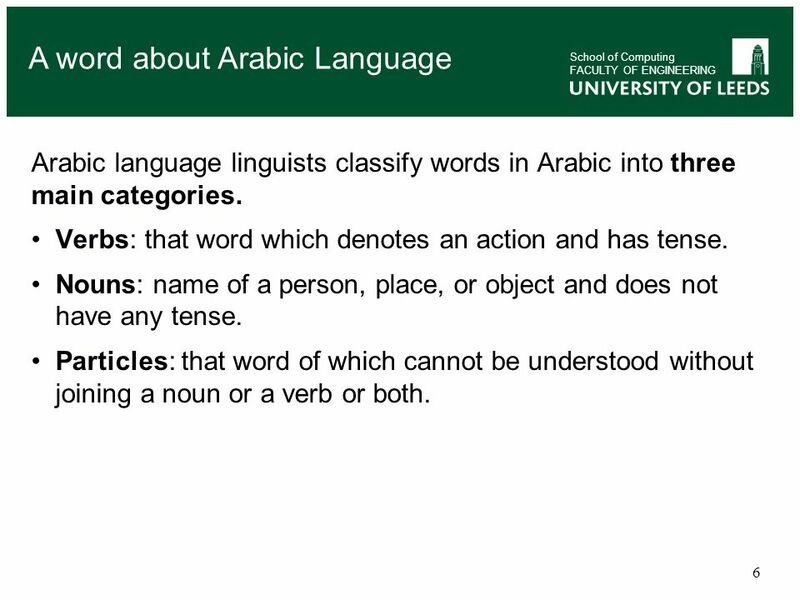 Blogs (text in blogs can be in Arabic script or in roman letters transcription) Gold Standard will be checked by Arabic language scholars. 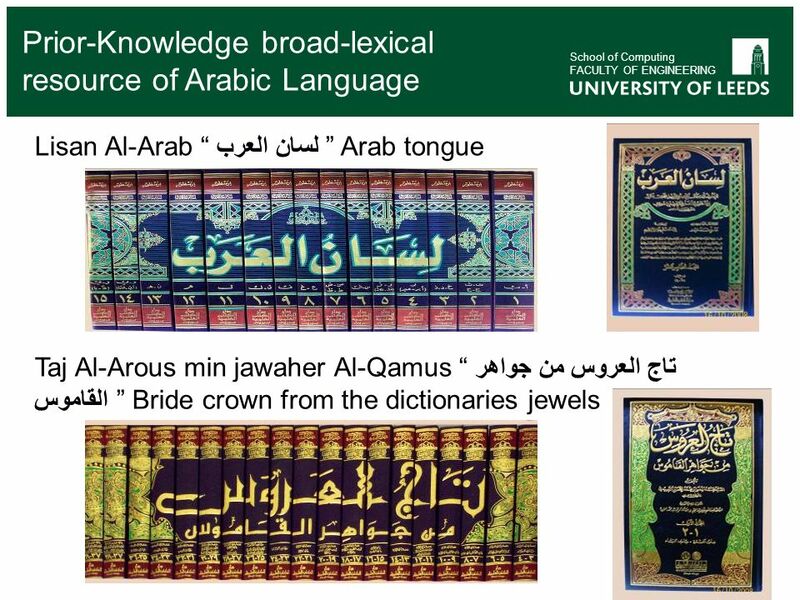 School of Computing FACULTY OF ENGINEERING Sample of Qur’an Gold Standard (vowelized) Sample of Newspaper Gold Standard (non-vowelized) Alif. Lam. Mim. Do men imagine that they will be left (at ease) because they say, We believe, and will not be tested with affliction? Lo! We tested those who were before them. Thus Allah knoweth those who are sincere, and knoweth those who feign. Or do those who do ill-deeds imagine that they can outstrip Us? Evil (for them) is that which they decide. Whoso looketh forward to the meeting with Allah (let him know that) Allah's reckoning is surely nigh, and He is the Hearer, the Knower. And whosoever striveth, striveth only for himself, for lo! Allah is altogether Independent of (His) creatures. And as for those who believe and do good works, We shall remit from them their evil deeds and shall repay them the best that they did. We have enjoined on man kindness to parents; but if they strive to make thee join with Me that of which thou hast no knowledge, then obey them not. Unto Me is your return and I shall tell you what ye used to do. And as for those who believe and do good works, We verily shall make them enter in among the righteous. Globalization will stay a hot topic of discussion for a long time. In this article, we consider in depth some of the questions raised by new writers who consider globalization as a new lifestyle for the modern man. Taking the lead from America, many writers describe the multi-ethnic and multicultural American life style as the ideal in the new global village where telecommunication, transportation, information systems and the media shorten the distances between disparate groups. Advocates of this point of view look forward to a new modern man, the Cosmopolitan man. 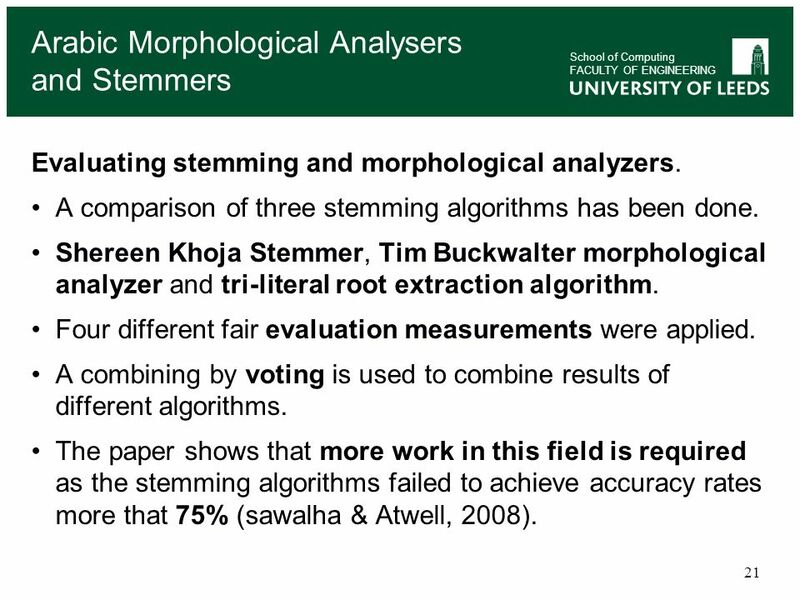 School of Computing FACULTY OF ENGINEERING Evaluating stemming and morphological analyzers. A comparison of three stemming algorithms has been done. Shereen Khoja Stemmer, Tim Buckwalter morphological analyzer and tri-literal root extraction algorithm. Four different fair evaluation measurements were applied. A combining by voting is used to combine results of different algorithms. The paper shows that more work in this field is required as the stemming algorithms failed to achieve accuracy rates more that 75% (sawalha & Atwell, 2008). School of Computing FACULTY OF ENGINEERING Evaluating existing Part-of-Speech tagger components. Gold Standard Fair measurements Multi-level tagset Analyzing & re-implementing algorithms of Part-of-Speech taggers. Best tagger components need to be re-implemented, using Python. 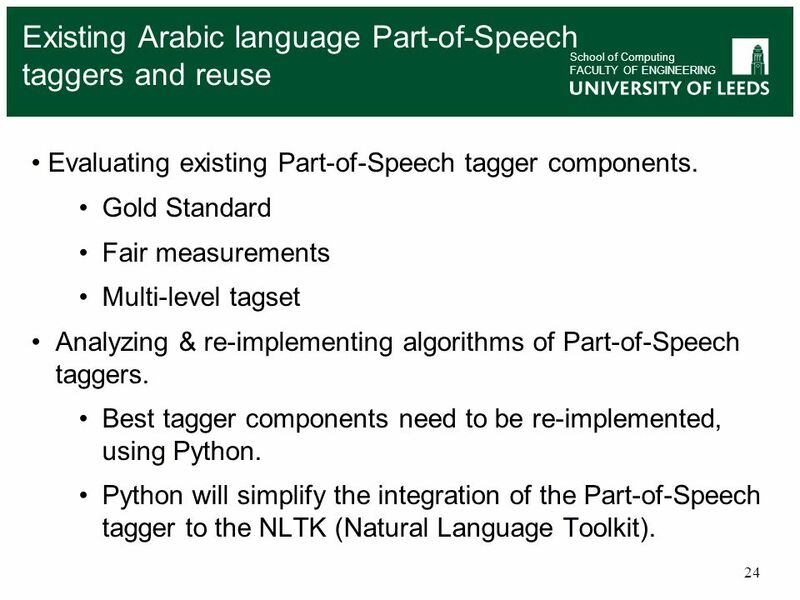 Python will simplify the integration of the Part-of-Speech tagger to the NLTK (Natural Language Toolkit). 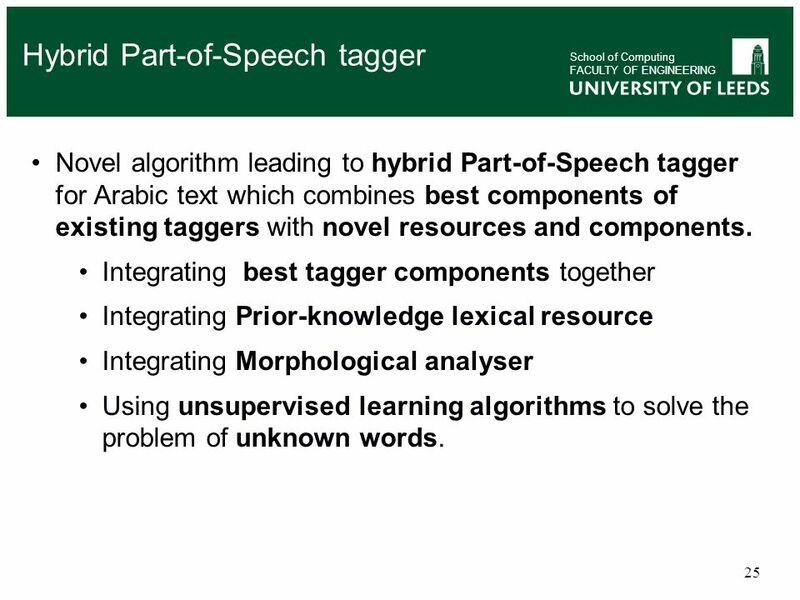 School of Computing FACULTY OF ENGINEERING Novel algorithm leading to hybrid Part-of-Speech tagger for Arabic text which combines best components of existing taggers with novel resources and components. 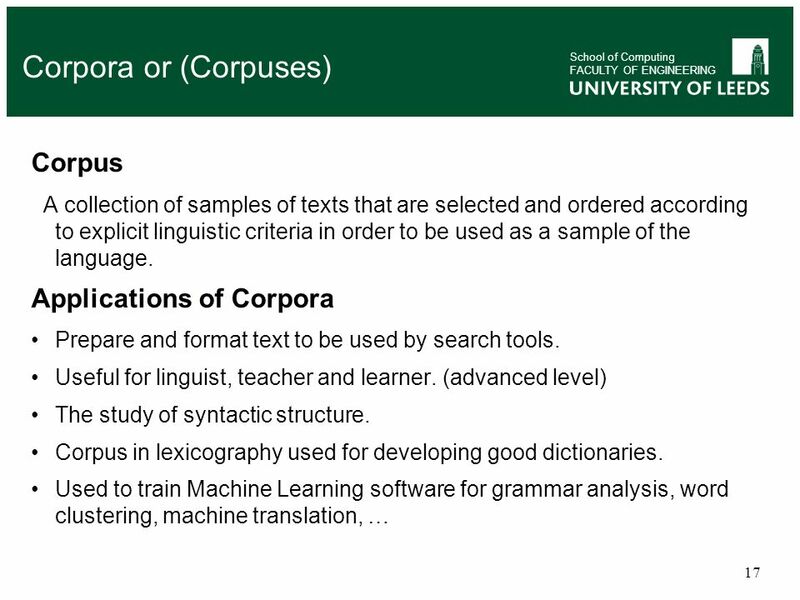 Integrating best tagger components together Integrating Prior-knowledge lexical resource Integrating Morphological analyser Using unsupervised learning algorithms to solve the problem of unknown words. 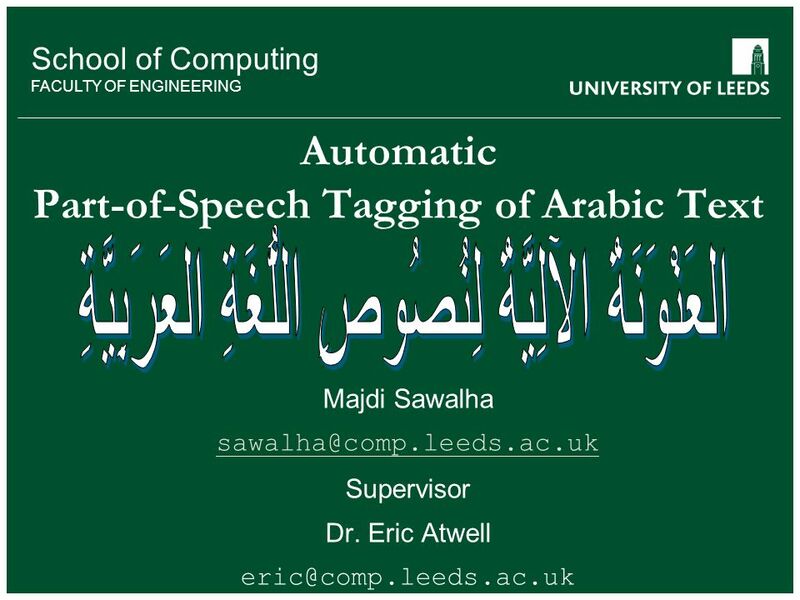 Download ppt "Automatic Part-of-Speech Tagging of Arabic Text"
School of something FACULTY OF OTHER School of Computing FACULTY OF ENGINEERING PoS-Tagging theory and terminology COMP3310 Natural Language Processing. 1 Lennart Lönngren University of Tromsø LOVE. 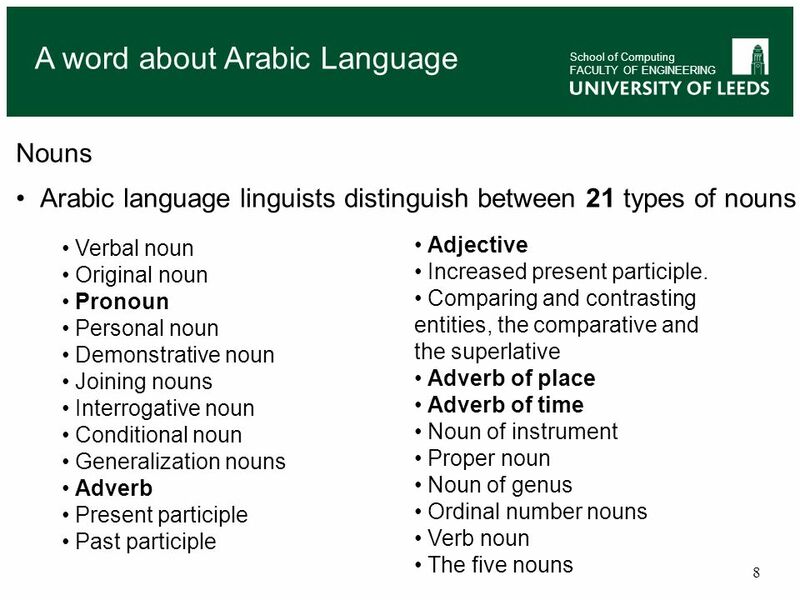 2 Let us start with a sentence in the active voice and its passive counterpart. A new Machine Learning algorithm for Neoposy: coining new Parts of Speech Eric Atwell Computer Vision and Language group School of Computing University. Ian Cushing English teacher, Surbiton High School UK Linguistics Olympiad Committee Education Committee, Linguistics Association of Great Britain Grammar. 1 A Hidden Markov Model- Based POS Tagger for Arabic ICS 482 Presentation A Hidden Markov Model- Based POS Tagger for Arabic By Saleh Yousef Al-Hudail.